In case you may have not gleaned this from the above title, this is one last plea for you to take the Jonas Brothers seriously as a force to be reckoned with (those of who you are like huh? is exactly why I'm writing this)...sort of. Feel free to naysay me all you want, I've heard the entire book at this point. Just allow me to say my piece this one time, then feel free to judge. That's all I'm asking. 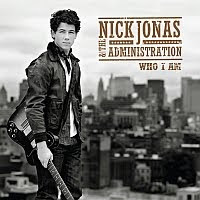 In case you haven't heard, the Jonas Brothers themselves are on a bit of a break while kid bro, and basic music mastermind behind the operation, Nick, strikes out on his own with his "side project" band dubbed Nick Jonas and the Administration. If the title feels strange to you, it's probably because you're not inflicted with what the fangirls call OJD, Obsessive Jonas Disorder. No, I'm not kidding. Stop laughing. Anywho, the title is a direct reference to Nick's developed family (and therefore fan) nickname of "Mr. President", because despite the fact that he is the youngest in the band, he's a bit of an old soul who tends to take the lead in terms of the group's direction, and also tends to do the most of the group's writing. Quick Lesson: The Jonas Brothers appeal outside of the fan universe was always about lil' Nick. It was thanks to him and his curious set of pipes that his brothers jumped into the business, as Nick led the parade for the Jonas clan. At age 7, he debuted on Broadway. He appeared in more than five Broadway shows between 1999 and 2003. In 2002, he wrote a song with his also musical father called "Joy To the World", in which proceeds went to Broadway Equity's charity toward fighting AIDS. Two years later and 12-year-old Nick found himself signed to a solo deal with a mostly Christian subsidiary of SONY's Columbia label, and recorded his debut album. The record ultimately was shelved due to shakeups within the label structure, and Columbia's new president, Steve Greenburg, who is most commonly referred to in the music biz prior to this find as "discovering" Hanson, thought that although Nick's material was lacking, he certainly wasn't. He was intrigued by Nick's musicianship, as well as the charisma both personally and musically with his two elder brothers, and decided in 2005 that the group would be signed to Columbia as a brother act. It was Greenburg who encouraged all three boys to expand their musical repertoire to include the likes of Johnny Cash, Bruce Springsteen and others, as well as to focus more on their instrumentation. To this day, all three brothers are accomplished musicians, with the most noted being Nick, who often moves deftly between guitar, piano and drums during performances. 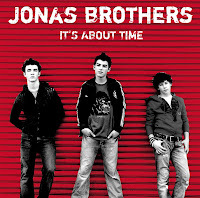 The result was 2006's It's About Time, a pop/rock offering on Columbia which barely sold over 50,000 copies upon limited release. It was littered with re-worked Busted covers (all of which went right through me, as I wasn't much for the originals, to be honest) and borderline-sappy originals that made it a little too obvious how young this band of brothers were. There were a few shining lights on the record though, particularly an ardent little ditty called "Please Be Mine", purported to be the first song the three boys wrote together, and the song that gained them their deal with Columbia. However, the "demand" just wasn't there, and the boys were dropped. This didn't stop their determination. The group rented a van and continued to tour, playing small shows and festivals around the country, promoting themselves and connecting with fans through MySpace and YouTube, and writing new music despite having no record contract. Folks over at Disney's Hollywood Records quickly picked up the scent, and signed the boys in early 2007. What happened next seemed to happen in super fast-forward. The group released a slew of pop/rock-inspired songs off pristine pop sophomore record Jonas Brothers (choice cuts: "Inseparable", firey "Goodnight and Goodbye" and a slam at their former label "Hollywood"), with the videos mostly only gaining play on the Disney Channel, the biggest being their breakout "S.O.S.". That August, they appeared in an episode of Disney's main hit, "Hannah Montana", and their appeal was cemented. Next then you know, the kids have huge, sold-out arena tours, a couple of songs on mainstream radio, and release two more albums, including my personal favorite, 2008's A Little Bit Longer (especially on cuts "Lovebug", "Pushing Me Away" and "Can't Have You"). Now, it seems that the hand that fed them (Disney) seems to be exactly what is biting them in terms of lacking a kind of legitimacy. So many are so quick to toss them off as a pre-fab, teen pop passing fad, when its clear, especially for Nick, that this is a group of dedicated musicians who are much deeper than they appear, growing by leaps and bounds with each record. I often wonder that had they not signed with Hollywood and found another label if their appeal would be more universal, but obviously, we'll never be able to figure that much out. Just as Demi Lovato somewhat struggles with establishing herself away from the Disney brand, despite being critically lauded by respected and esteemed musicians like John Mayer and Jon McLaughlin, so too the brothers Jonas attempt to be taken seriously as more than just a group of genial faces with invisible Mickey Mouse ears. The main complaint seems to be their sugary image whilst attempting to be considered rock and roll, but since when does being somewhat open with your religion been a crime? Also, people are quick to point out issues with their vocals, when I certainly have choice words for the dozens of rock, pop/rock and emo bands that litter the landscape. Have we really become such an Auto-Tuned focused market that having a perfect vocal is all that matters? It all stems back to their Disney Machine upbringing, and it pains me to think that people aren't willing to look past the label for the potential that they truly have. Everyone has to start somewhere. John Fields, who has written and co-produced the majority of the Jonas's catalogue, as well as Demi Lovato, and appearing on records by Jimmy Eat World, P!NK and Deltra Goodrem, among a myriad of others. Michael Bland and Tommy Barbarella, a former drummer and keyboardist, respectively, for Prince during the New Power Generation era. Lovebug is quite cute. plus they did some rocky type christmas number i appreciated. That is all. Feel free - You like it, you like it - That's about all there should be too it!